Conceptual designs for a new mausoleum facility to provide approximately 3,000 casket spaces (crypts) and 200 to 400 urn spaces (niches, etc. ), with approximately one third of the crypts/niches to be interior and two thirds to be exterior, or garden style. Our initial design approach, consists of a main, central Mausoleum Building flanked by two Garden Mausoleum Buildings. The Mausoleum Building contains a chapel lined with walls of niches, restrooms, a small sacristy for clergy, natural daylighting, pitched roofs, 7 level high crypt structures, radiant floor heating system, a sales office, a port-cochere, and a combination of interior and exterior crypts. 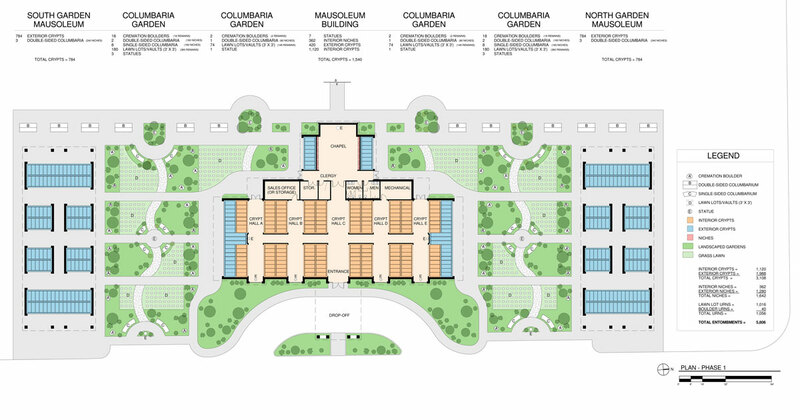 The Garden Mausoleum Buildings are separate, free-standing structures “connected” to the main building by proposed Columbaria Gardens. The conceptual design for the new mausoleum has been developed with the intent that it can serve as a “prototype” design which can be modified and adapted for construction at multiple Diocesan cemeteries. The basic components of the design concept (main Mausoleum Building, Garden Mausoleum Buildings, and Columbaria Gardens) can easily be reduced or enlarged in size, and reconfigured to most efficiently adapt to different building sites at other cemeteries. 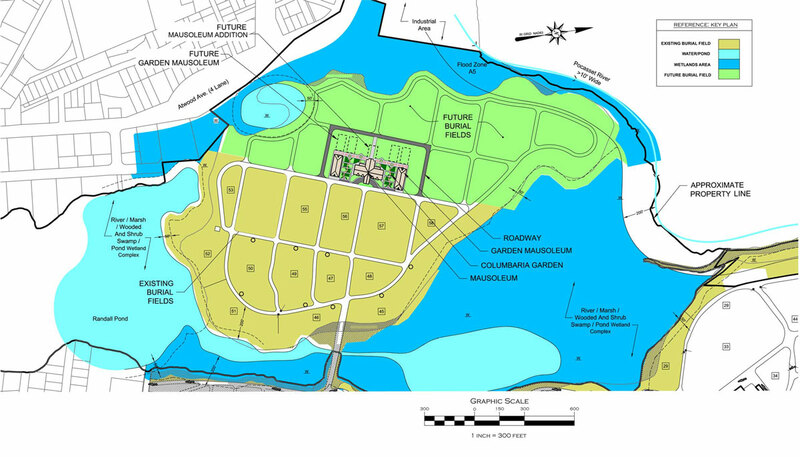 The conceptual design concept includes design for future growth of the mausoleum facility. The proposed future development consists of an addition to the Mausoleum Building which includes a second chapel, allowing for concurrent burial services in two chapels, accessed from opposite sides of the building. 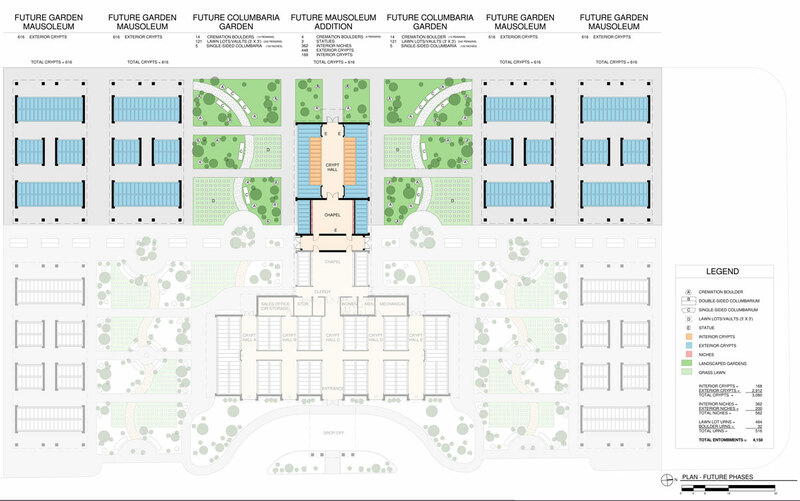 The future development also includes a new crypt hall, up to four free-standing Garden Mausoleum Buildings and additional Columbaria Gardens. These future phases of construction will provide an additional 168 interior crypts, 2,912 exterior crypts, and 562 niches.